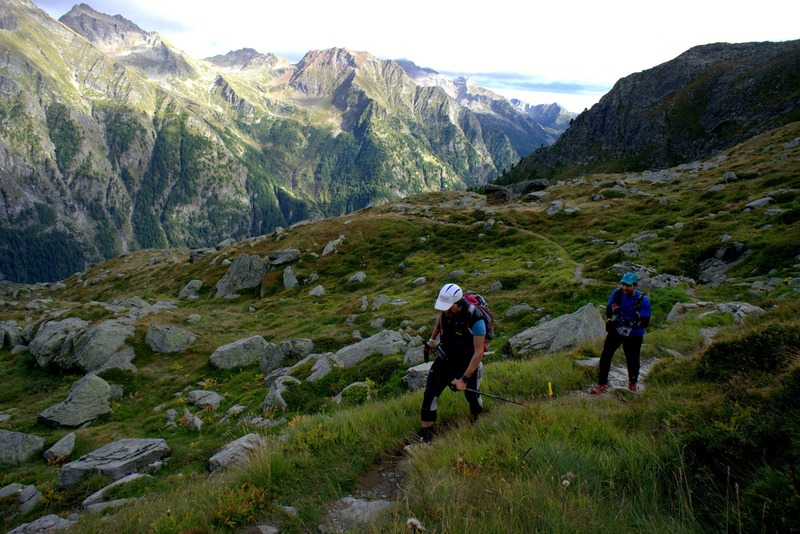 Just before noon Wednesday, Beat arrived in Gressoney, kilometer 200, in a sour mood. Despite the near-30C-temperatures in Donnas just a day ago, the weather had taken a sharp turn for the worse. Rain throughout the night had slicked the rocks on the trail, making for sketchy and slow descending. He grabbed a big plate of rigatoni with tomato sauce and tuna, the standard (and only) dish served for the duration of the Tor des Geants. I'd taken a cue from the race food and mostly eaten this kind of fare myself. Rigatoni with tuna was an easy thing to store and cook up fast, and bread and jam was something I could keep in my car. Rural Italian grocery stores only seem to be open about six hours a day, and restaurants were never fast enough and also not open at convenient-for-me times (early and late.) 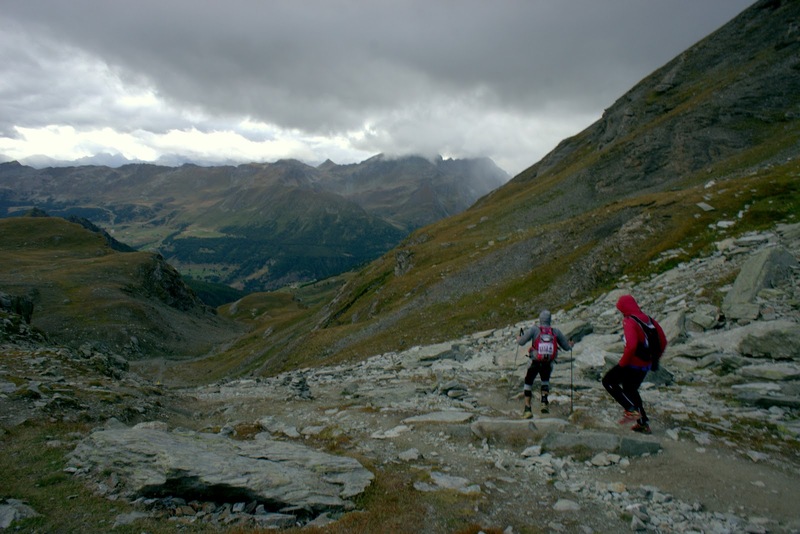 Still, at this point I'd mostly run out of groceries and was down to a few candy bars and crackers that were left of my once-giant bag of UTMB trail food. I eyed Beat's lunch greedily. 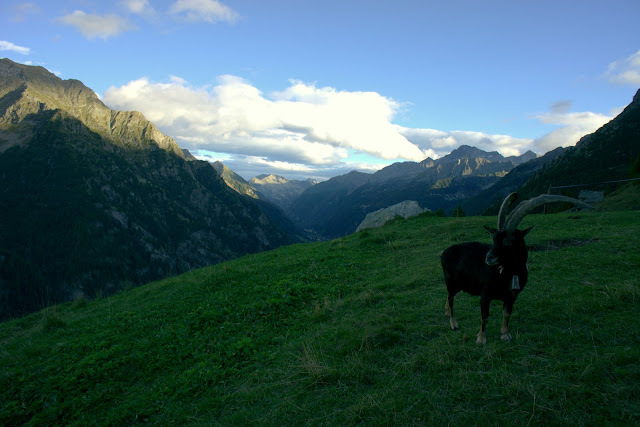 Like last year, I tagged along with him out of Gressoney along the river valley. The weather was still drizzly and cool, and the wind had picked up since he arrived in town. It seemed like the clouds were beginning to clear, but the wind was fierce and temperatures were dropping. I was only going to follow him as far as the next rifugio and then go to the pass on my own. He checked out of Gressoney with a Russian runner named Dmitry, and they traveled together out of town. The steep, grassy slopes surrounding Rif. 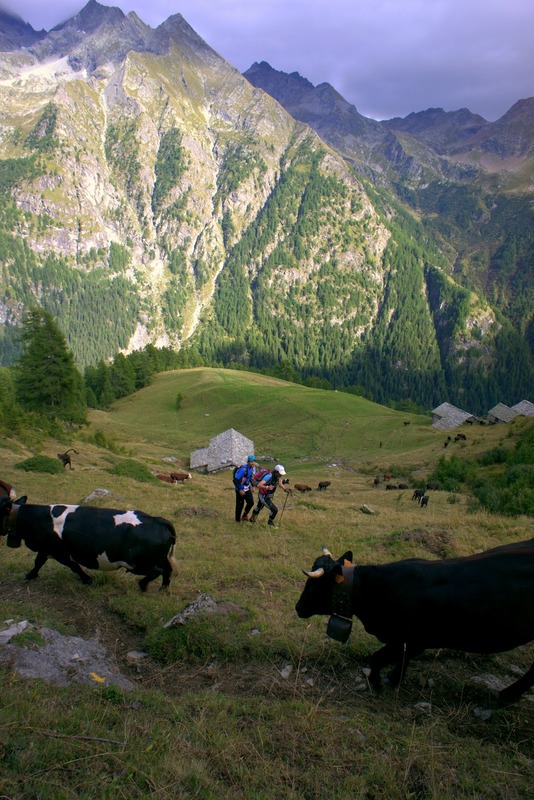 Alpenzu were populated by goats and a herd of cattle. Just after I left Beat and Dmitry in Alpenzu, I encountered the cattle just as the driver was herding them down the mountain. Dozens of cows came tearing around a large rock outcropping, mooing loudly and crashing into each other as they stampeded down the narrow switch-backing trail. I saw them coming and reacted with a completely instinctual flight response, jumping off the trail and darting straight up the mountain like a frightened cat as stampeding cattle streamed around me. They scared me all the way up to the rock outcropping, and then I had nowhere left to go. So I stood and waited, realizing that the slope I had just climbed was steep enough that I wasn't going to have an easy time getting down. Beat and Dmitry reached this point while I was waiting, and also cut directly up the slope to avoid the cattle (they were still running but the back of the herd had mostly calmed down by this point.) By the time the trail was cow-free, Beat, Dmitry and I were grouped up again. I know they're just cows, but that was one of the more frightening animal encounters I've had on a trail. The most scary was a pit bull that attacked me in Maine ten years ago. I have to say, wild animals are usually more polite than domesticated ones. Beat and Dmitry were moving up the mountain at a solid clip. I could barely hold their pace, let alone exceed it, even though I was relatively rested. It may have helped that the wind was driving a fierce chill. Beat didn't want to put on his jacket just yet because the steep climbing made him sweat, but it was difficult to stay warm unless we climbed hard. The wind reached gale force at Col Pinter, elevation 9,107 feet. 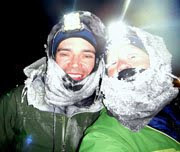 Beat and I barely managed three words before he and Dmitry began the sprint down the mountain. Despite his extremely sore feet and now deeply fatigued legs, he was able to break into a solid run. Amazing what survival instinct enables us to accomplish. I spent a few minutes at the Col, huddled in the wind shelter of a rock as I devoured a couple packets of Nutella. (I was fairly bonked, and I was literally and comically out of available food.) In less than five minutes, ice had already formed in my Camelback valve — it was really cold. On the way back to Gressoney, I made friends with a goat. I didn't mean to, but he was so cute that I couldn't help but sneak up to shoot a photo. After I did this, he followed me for at least three quarters of a mile down the trail to Alpenzu, his little bell jingling the entire way. I'm not sure what he wanted from me. In the past, I've seen mountain goats shadow hikers because they want to lick the salt off their skin. Perhaps this goat wanted the same. He was adorable, though I admit after ten minutes of stalking I felt uneasy. He stood half as tall as me and had giant horns — he could have easily rammed me off the mountain if he wanted too. 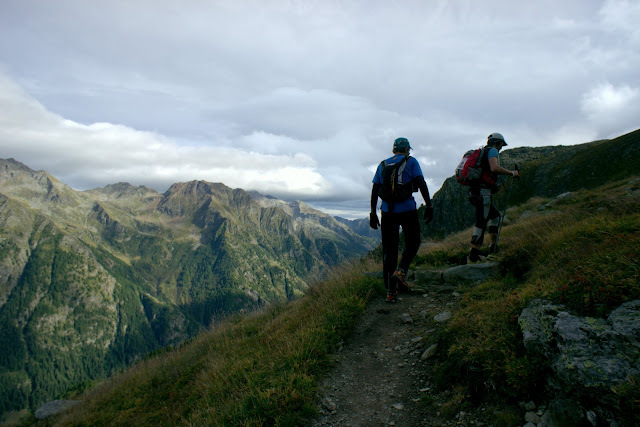 I barely made it back to Gressoney by dark and decided to wait for a while at that checkpoint to see if my other friends came through, before swinging around to Valtournenche to intercept Beat again. I'd hoped to grab a pizza or really anything in town, but it was after 8 p.m. in the off season and I didn't find anything open except for a bar. The bar may have had food, but it was quite crowded and I was feeling shy (Italians are so friendly, but it's a bit overwhelming for an introvert like me who doesn't speak the language.) Of course it was my fault for being shy and not being better prepared, but I had to settle for a miserable little dinner of stale breadsticks and big spoonfuls of jam from the car. I just barely missed Ana when she arrived at 9:30 p.m., and she went straight in the back to sleep. 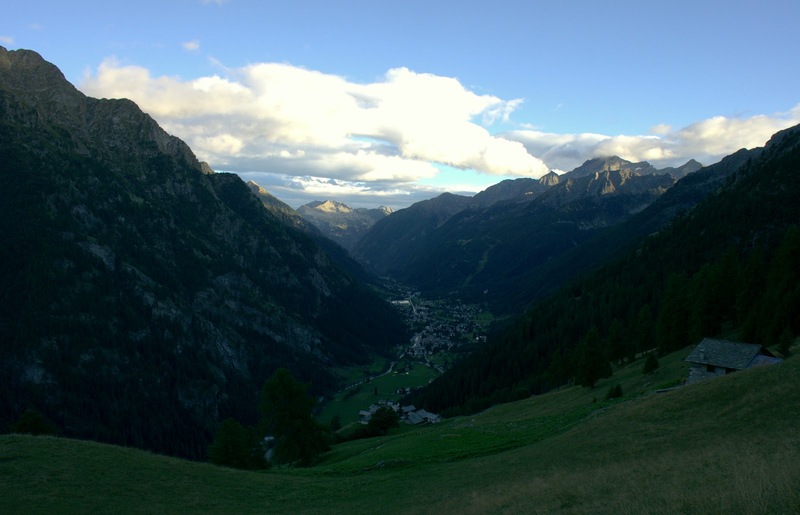 Although I was hoping to grab a nap of my own in the car before Beat arrived in Valtournenche, I decided to stay in Gressoney as long as I could to warn Ana about the cold. It was already near freezing in town, still windy, and I was worried about what was going on at 9,000 feet. Ana's a tough woman who can take care of herself, but she's also from the coast of Spain where it hit 50C just a few weeks ago. If she didn't have big warm mittens or a balaclava, I wanted to give her mine. During my wait I also ran into Gabi, a friend of Beat's who lives in Zurich. Gabi is a tiny Swiss woman who ran all of race so far wearing big dangling earrings and a tiara, like an actual jewel-encrusted tiara. Her voice was nearly gone and her throat made horrible gurgling noises as she breathed, indicating a serious respiratory infection. She guessed she had bronchitis and was distraught. The Gressoney cut-off was in less than two hours, so she had to go back out that night if she went out at all. I hated to see Gabi give up on something she wanted so badly, but I felt compelled to emphasize just how cold and windy it was on Col Pinter. Personally, I would have felt nervous about going up there in the middle of the night being rested and healthy, let alone as sick as she seemed. Doctors took her temperature and made the decision for her, forcibly pulling her from the race and instructing her to seek medical attention immediately as she likely had pneumonia. Poor Gabi. It was heart-wrenching to be there as she accepted this. Ana was well-dressed but extremely tired when she woke up at 11:30. At that point I really had to go to catch Beat, so we only exchanged a few brief sentences after I made my case for the cold on the pass. She's still plugging away out there — amazingly tough, that woman. I admire her greatly. Luca from Courmayeur here: too bad the race has been suspended now because of the ice at Malatrà, as I was looking forward to see Beat arriving here! I've really enjoyed your series of posts just like last year and am seriously tempted by the 2012 edition. I hope Beat is in as good order as can be expected after this second epic. Thanks for these reports snd spectacular images.